If you’re thinking about writing for the American market, one thing that can trip you up is sounding too British. Confusing the reader with a British or European sounding ‘voice’, when they are expecting American (as they will in Hollywood) will pull them out of the story and reduce your chances. 3. Unless absolutely necessary, don’t set your screenplay in Britain. Set it in the US or some place generic such as a city or suburb etc. Write a script that can be set anywhere. 4. When writing dialogue (and even narration for that matter) – do not put in colloquialisms, unless it is necessary for your character to have a specific identity. However, this ‘native’ language must be easy to read and understand. Put yourself in the shoes of a 24 year old American script reader – can they understand what you are saying? And in Hollywood, if any additional flavour is needed, it’s best to leave this to the director and actors. Don’t give the reader incentive to ditch your script and move onto the next script in an endless pile of specs. 5. Americans do not use the metric system. So remember its Fahrenheit not Centigrade, miles not kilometers and lbs (pounds) not kilos (or even stones). 6. Time. Americans do not say ‘half past’ the hour (i.e half past eight or half eight) – that will be sure indicator that you are British. They would say Eight thirty or Eight fifteen. They also do not use the word ‘fortnight’ either. 7. American scripts are often written in a kind of screenplay slang, like movie haiku. Read a bunch of Hollywood scripts, you will soon pick up the rhythm, timbre and tone. 8. Make it tighter. Put simply, American screenplays use less words to describe more action. Tighten your screenplay. 9. Onomatopoeia – dynamic action in your story can be written how it will sound or feel on screen. The car Screeeeeeetches to a halt. This brings the action to life. Boom! 10. Paper size – American scripts do not use A4 paper size, they use US Letter. Not a huge difference but you may as well format for their paper size so when they print out your PDF, it fits perfectly. 11. Americans have mythologised their culture in movies and TV. Things that could never happen in UK drama are simply part of the world in American film and TV. 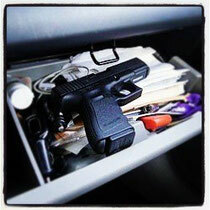 Open the glove compartment in a car in an American movie and you will likely find a handgun. In America, they make movies, in Europe, we make films. If you want to make it in Hollywood, write a movie and not a film. Write inside of that mythologised American world. 12. Write parts for stars. In Europe, we have actors. In America, they have stars. Write a part a movie star might attach to and you have a much better chance of getting optioned and produced. There’s only so much you can fake from the UK by watching US TV shows and movies. When polishing your script, come over to America and spend time in the world of your story. This will bring a whole new level of authenticity to your work.